I cannot find apache2.conf file and blocks. Please help me. Also, please keep in mind that certificates generated by Let's Encrypt are free, and can be generated independently without the plugin. It seems that the symbolic link for server.key and server.crt was not properly created. Could you execute the following in a Linux console inside that instance? k for server.key and server.crt was not properly created. I have also messed up big time. I need to revert the server.csr to the old version as my site is not accessible. How do I do this? 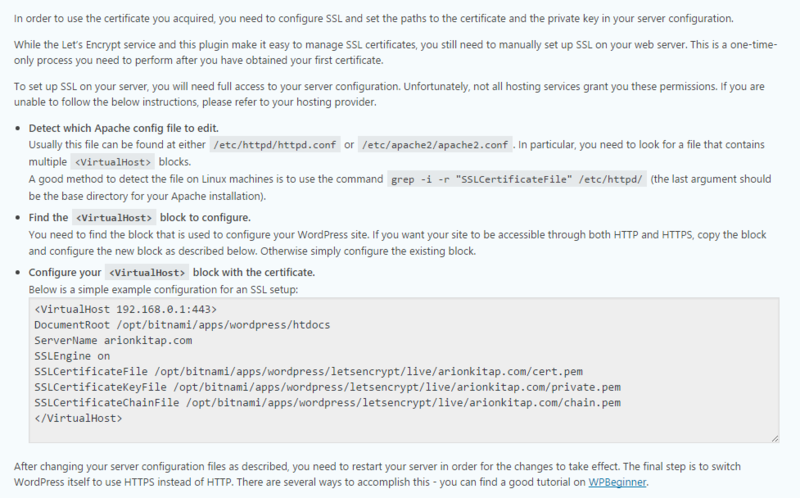 I had similar issue generating the SSL. I now just want to revert to how it was without certificate. Could you please run the Bitnami support tool? It will gather relevant information for us to debug the issue. Apart from that, could you please share with us the output of the following command? I have run the Bitnami support tool and have the code for you. Can I paste this here or is there somewhere else to open a ticket? After step two, I got an error message and that there was a name error (sorry don't have the details anymore). However, I continued to run through step 3 and started the server. You need to stop all the web server before running the lego command as it uses the 80 port to generate the certificates, did you get any error message when stopping the services? Was everything stopped after that? down until I fix it again! I hope you can see the exact error message. Thank you for your response, Jota.